A Diebold Opteva 520 ATM crashed on the campus of Carnegie Mellon University on Wednesday, and then rebooted without bringing up the ATM software, alarming financial institutions and Americans concerned about e-voting alike. As it turned out, the resulting Diebold PC was not particularly functional, even though it had Windows XP running. The main criticisms that students had were 1) the lack of Internet connectivity and 2) lack of a keyboard. However, students were able to use the Character Map program to enter text, enabling the text-to-speech program to intone "What, do you think I'm made of money?" to potential customers. This fulfills the expectations raised for this device, which Diebold claims "will deliver the next generation of services to financial institutions and ATM users, including new opportunities to enhance customer relationship management (CRM), marketing and advertising applications" (news release). The Windows Media Player was set up to loop Beethoven and Talking Heads for the further amusement of customers. Americans who would like to have secure, verifiable elections in their own country were less amused, since Diebold is also a leading proponent of electronic voting machines. Clearly, these new ATMs, with their greater (dys)functionality are bringing us closer to the Lucky Dragon ATM of William Gibson's 1999 novel All Tomorrow's Parties. These ATMS really had a business attitude; if you messed with them, they would mist you down and then electrify themselves. 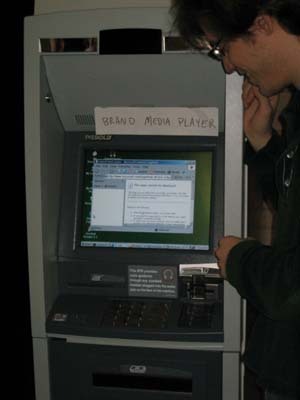 Thanks to ATM Media Player (Gizmodo) who brought us the original story Diebold ATM Crashes (Midnight Spaghetti). Don't forget to take a look at the Diebold Opteva 520 ATM website; it has a nice multimedia presentation that asks the haunting question "What if your ATMs were so smart that they could repair themselves?"